Hundreds of police officers accused of racism in official complaints over the past five years have not been sacked from their jobs, a new investigation has found. While nearly 800 complaints of racism were filed against British police officers since 2010, only 20 officers were dismissed, the BBC has found. According to the investigation, such accusations were leveled against more than 6,600 officers. 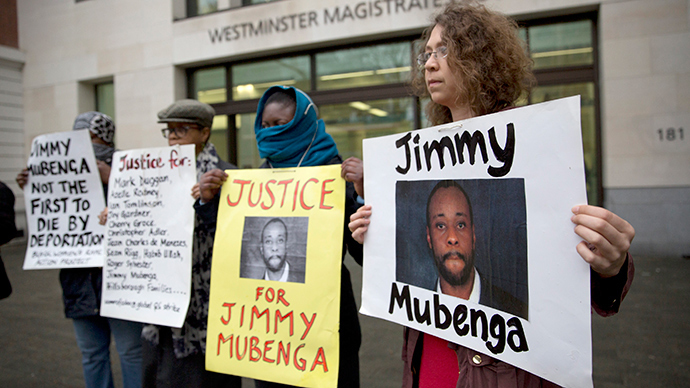 The findings follow the recent acquittal of three security guards accused of killing Jimmy Mubenga, a 46-year-old Angolan migrant who was due to be deported in October 2010. The guards were accused of manslaughter after Mubenga died while in their custody. One victim of police racism, Don Lorenzo, was awarded £17,000 in damages in 2011 after he faced racial abuse from an officer in the West Midlands police. “I don’t think the police want to face the prospect of having to sift out the bad apples,” he said. Racism in the UK police has come under renewed scrutiny following the deaths and systematic abuse of African Americans in the US, including Eric Garner and Michael Brown. However, senior UK police figures have defended their investigations and attempts to stamp out racism within the force. “Around 300 officers per year end their careers because of misconduct and, proportionally speaking, officers have a much higher chance of being dismissed where it is felt that there is a case to answer for racism,” said Deputy Chief Constable Alan Goodwin, who is also the national policing lead for the Association of Chief Police Officers (APCO). APCO has a “determined mission to weed out discriminatory behavior in the police service,” he said. “There is no place in the police for racists and I encourage anyone from either inside or outside the service who sees an officer behave in a discriminatory way to report it, safe in the knowledge that there will be a full investigation and an appropriate outcome,” he added. Of the 20 police officers fired over racial abuse, half came from London’s Metropolitan Police, and include one officer racially abusing a train conductor because he did not allow his friends to travel for free. Other officers have been fired over remarks about colleagues and for posting racially offensive comments on social media. Earlier this month, activists created a series of satirical posters targeting racism in the Metropolitan Police force, highlighting the disproportionate arrest rate of ethnic minority groups compared to their white British counterparts.